Nimmo acknowledged Wednesday that he's still dealing with a fair amount of soreness in his neck and lacks full range of motion, but he doesn't believe the issue is serious enough to result in a trip to the injured list, Anthony DiComo of MLB.com reports. Nimmo is out of the lineup for Wednesday's series finale with the Phillies, and his assessment of the injury suggests he won't be available in a pinch-hitting capacity either. 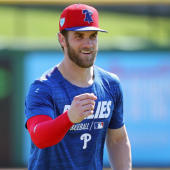 The outfielder took a muscle relaxer overnight to address the stiffness he was experiencing in his neck, but it failed to result in much improvement. Nimmo will get another rest day Thursday with the Mets off the schedule, but he may need to show notable progress ahead of Friday's series opener in St. Louis to meet his goal of avoiding the IL.